Sustainability and Cities examines the urban aspect of sustainability issues, arguing that cities are a necessary focus for that global agenda. The authors make the case that the essential character of a city's land use results from how it manages its transportation, and that only by reducing our automobile dependence will we be able to successfully accommodate all elements of the sustainability agenda. The book begins with chapters that set forth the notion of sustainability and how it applies to cities and automobile dependence. 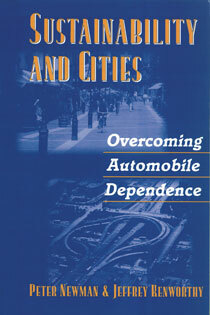 The authors consider the changing urban economy in the information age, and describe the extent of automobile dependence worldwide. They provide an updated survey of global cities that examines a range of sustainability factors and indicators, and, using a series of case studies, demonstrate how cities around the world are overcoming the problem of automobile dependence. They also examine the connections among transportation and other issues—including water use and cycling, waste management, and greening the urban landscape—and explain how all elements of sustainability can be managed simultaneously. The authors end with a consideration of how professional planners can promote the sustainability agenda, and the ethical base needed to ensure that this critical set of issues is taken seriously in the world's cities. Sustainability and Cities will serve as a source of both learning and inspiration for those seeking to create more sustainable cities, and is an important book for practitioners, researchers, and students in the fields of planning, geography, and public policy.